Bedtime stories, midnight feasts, pajama parties, and arguing over who can get the top bunk; all these are childhood moments that are associated with space-saving bunk beds. Fun factor aside, the beds are actually the most practical options for small rooms. That's not even mentioning the fact that they’re pleasing to the eye and capable of fitting into all stylishly designed homes. There's just one problem: there is a lot that requires consideration when picking out the best one for your space. It’s not like choosing regular bed frames as there are beds that are suspended off the floor with bunk beds. To help you make the right choice as things can easily get confusing, we’ve listed the best bunk beds you can get from the reputable and hip Swedish furniture manufacturer, IKEA. The company does not just make bunk beds that are attractive, functional, and affordable, but their products also undergo rigorous testing to ensure the safety of users. Check out our favorites below! If you are on the lookout for a bunk that's well-made and won't cost you your arm or leg, then the Tuffing in Dark Gray Bunk Bed is an excellent choice. It has been given with a strong, powder-coated steel frame. It's a twin size bunk bed that's affordable without sacrificing the bed's durability or safety. We admit this is not the most stunning or elegant option, but it is definitely the most financially savvy. Take note: the unit comes with a comprehensive warranty, which is something you can rarely enjoy if you purchase an affordable piece of furniture from other brands. Because the ladder system isn't protruding, the Tuffing Bunk Bed is great even inside tricky rooms where space luxury is absent. The bunk bed is purposely designed to be low to ensure the safety of children as they take a good night's rest on their new bed. The entire unit is 51 3/8 inches tall with a maximum loading capacity of 220 lbs. Its assembly only took us an hour, so it's great if you are a busy parent. 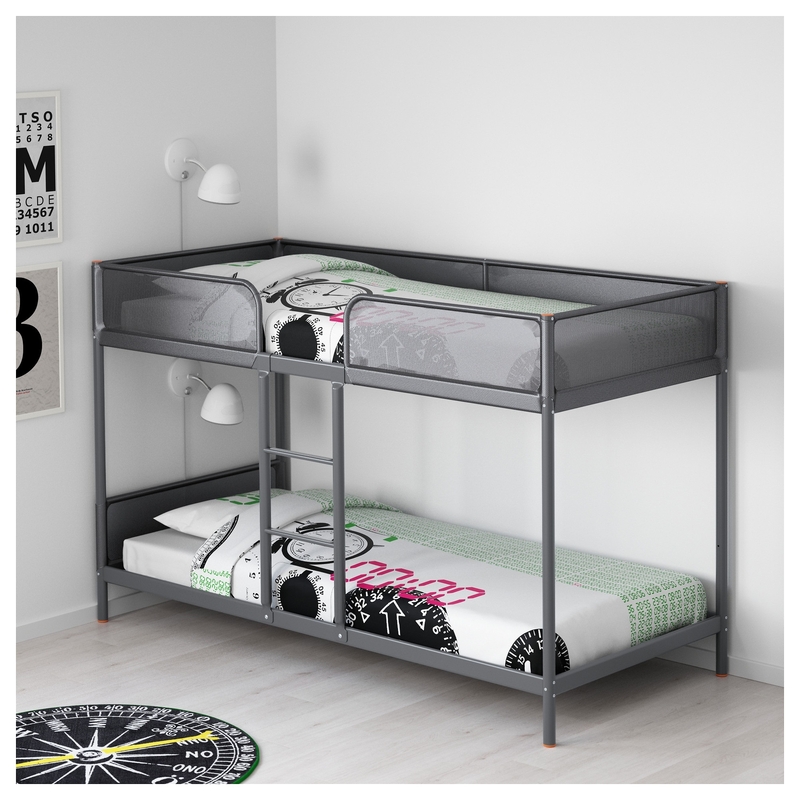 An excellent bunk bed that's stripped of bells and whistle, the SVÄRTA Bunk Bed Frame will last a lifetime, making it a good option for your money. What impressed us with this IKEA bunk bed is it offers the option to add a pull-out bed to be placed under the bottom bunk for an extra sleeping space. If you have three kids, this one's a must-have in your home as it saves a great amount of space and it allows the kids to sleep separately. As soon as the kids outgrow their love for the bunk bed, the unit will make for an excellent guest room bed as it has a maximum loading capacity of 220 lbs. Be a forward-thinking buyer and choose this beautifully finished, powder-coated steel bunk. Just like with all furniture from IKEA, it has a comprehensive warranty to offer protection to your investment. If you are on the hunt for a thoughtfully crafted bunk that even your grandkids can enjoy, then the MYDAL Bunk Bed Frame is worth considering. It is made of a renewable material, solid pine wood, which means it will last for several decades. It comes with the manufacturer's comprehensive warranty and it's lead-free, exceeding industry standards in terms of safety. The bed comes with an integrated ladder system and guardrails. Both the beds on the model can fit the standard single beds that are up to 8 ¼ inches thick each. What this means is your children won't quickly outgrow their bunk. As the piece comes with a low profile and has a total weight of 28.10 kg, it won't be tricky to set up. The assembly can be done in under an hour so you won't have to plan hiring someone or roping in a handy friend to help out. As soon as the bunk is assembled, the dimensions of the bed are 77 1/8 x 41 x 61 3/4 inches. In black brown, the NORDDAL Bunk Bed Frame has an understated, yet classy style that is sure to match any bedroom decor. It has perfectly balanced economy with robustness as it's made of solid wood which makes up the main parts and bed base slats; fiberboard for the bed frame panel; and galvanized steel for the most durable supporting rail. The beds can take standard single mattresses but they're sold separately. What impressed us with the NORDDAL Bunk Bed Frame is the product's craftsmanship. In person, it is clearly an exceptionally made product. It is worth your every penny, too, as the beds can be separated and placed in different rooms if you wish! It's worth noting that even though it's an affordable piece of furniture, it isn't cheaply made; it doesn't wiggle back and forth which means you won't have anything to worry about even if your kids are hard on their beds! When assembled, it has overall dimensions of 77 3/4" x 40 1/8" x 63". As mentioned earlier, the SVÄRTA Bunk Bed can be added with an under bed, the SVÄRTA pull-out bed! It's also made of powder-coated steel with a base made of a mixture of solid and engineered wood. As it is made to be paired with the SVÄRTA bunk, it'll easily fit under it. What made us decide to add this to our list of the best bunk beds available is because we know parents need extra sleeping space especially when kids are at the age when they constantly host slumber parties. With the SVÄRTA Pull-out Bed, it will make all your children's Friday night parties a bit easier on you. The unit can take a twin or single size mattress. Whenever there's no need for an extra space for sleeping, you can have your kids utilize the under bed as their additional large storage drawer. The pull-out bed pulls out smoothly so kids won't have a hard time doing it on their own. A stylish contemporary piece with a unique design, the STORÅ Loft Bed Frame balances both design and functionality. The bed is elevated to allow for extra bedroom beneath or simply to free up some floor space. If there is an award for the most flexible bed, then it would be given to this IKEA bunk. As you may have guessed, it is an excellent choice if your kid's room is short on space. There are so many possibilities with what can be added under the loft bed. The idea is to create a fun, creative space for your kid. Let your imaginations run wild of how you utilize the space underneath. You can even let your child decide on what it wants for the free space! The bed frame, of course, is a product of IKEA so you can rely on its safety for your child. However, it will require at least 9 ft of ceiling height to fit the bed and ensure the sleeping comfort of the user. The STORÅ Loft Bed can take a full-size mattress, and it requires DIY assembly. Making a kid's bedroom accommodate more than what the space allows is truly hectic. But, that won't be your fear any longer as this SVÄRTA Loft Bed Frame is all that you need. You will have the space that you desire for multiple activities. The bottom space can be used as your child's working area, play station, or extra sleeping space for your kid's visitor! The entire piece is made of a solid metal frame for longevity. The powder-coated steel construction is added with a durable ladder which gives a quick and safe access to the sleeping area. As it complements all home decor or style, you can be sure that the unit will blend seamlessly with the bedroom that you'll be furnishing. As it is a product that conforms to the latest safety standards set by authorities, it is one that you can rely on for being well-made. The bed can take a twin size mattress and requires assembly.